The workflow transitions are available for customers and sales representatives when RFQ Submission Flow and RFQ Management Flow workflows are activated in the system configuration. 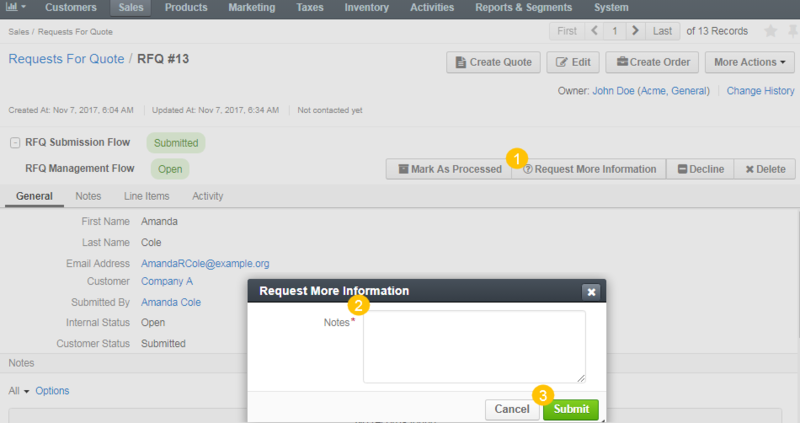 Navigate to Sales > Request for Quotes in the main menu. Find the required RFQ and click on it to open RFQ details. Once the RFQ is submitted by a customer in the storefront, it becomes immediately available in the RFQ management console in the Open status. To mark the RFQ as processed, click Mark as Processed on the RFQ page. This will notify the assigned sales representative that the quote is being processed. Marking RFQ as processed will change its internal status to Processed. Click Request More Information to open a text dialog for you to communicate with the customer. The customer will be notified by email and through the customer’s store account that more information is required. The internal status should then change to More Information Requested, and the customer status should change to Requires Attention. Once the customer responds to the request for additional information, the assigned sales representative is notified that the customer has provided the requested information and can continue processing the request. 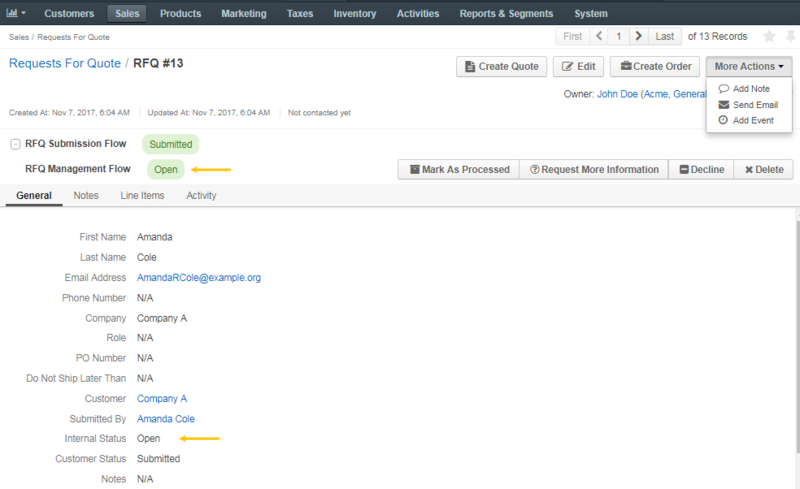 The internal status changes back to Open, and the customer status changes back to Submitted. To decline the RFQ, click Decline on the RFQ page. This will change the internal status to Declined, and the customer status to Cancelled. To delete the RFQ from the list, click Delete on the RFQ page. The RFQ will be removed from the customer user’s account. The internal status will be changed to Deleted.